GeneHunter allows you to reference worksheet cells other than the adjustable cells (chromosomes) that are included in GeneHunter's search for an optimal solution to the problem. 1. 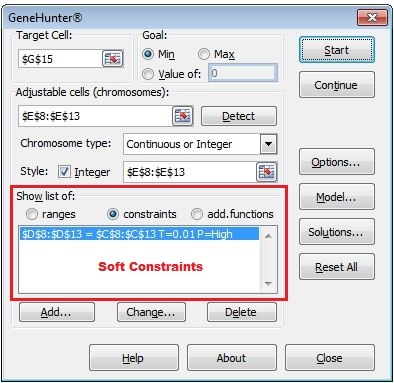 In the show list options in the GeneHunter Dialog Screen, click on constraints. 3. Either type in the cell(s) reference or select the cell(s) on the worksheet using the mouse. 4. Click on the arrow and select whether you want the constraint cell to be greater than, less than, or equal to a value in the condition box. 5. If you want the adjustable cell to be equal to a value in the condition box, either type that value in the condition edit box or select a cell or cells from the worksheet using the mouse. Note that if you add more than one cell in the cell reference box, there must be an equal number of cells in the condition box. 6. Set the Tolerance value by typing in a number in the edit box. The purpose of the tolerance value is to tell GeneHunter when it has done a sufficient job in satisfying a soft constraint. For example, if you specify a constraint that cell B4 must be less than cell B6, then you may want to tell GeneHunter that if the values in the cells are within plus or minus 0.5, then the solution is acceptable. To accomplish this, type 0.5 in the Tolerance edit box. Selecting the correct Tolerance value is based upon your knowledge of the problem. 7. Set the Priority for the constraint by clicking on the arrow and selecting either high, medium, or low with the mouse. If there is more than one soft constraint, GeneHunter uses this value to satisfy the constraints in the order you specify.